Izzy was eager to get into a pumpkin this year. I will say, I don’t think she really knew what she was asking for. Once I opened it up she was a bit shocked and definitely needed adjustment time for all the sensory goodness inside! 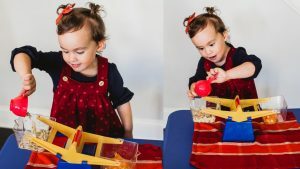 This is a great way for children to have a sensory experience, get exposed to math skills, fine motor skills and more. As always, I listed the developmental outcomes for all 3 steps and/or activities, depending on how you look at it. 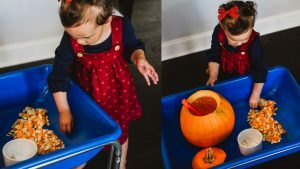 Start off by opening up the pumpkin and demonstrating how to use the scoop. Talk about the rules of pumpkin scooping and were they need to put the pumpkin seeds and guts. Discuss all the senses… minus taste. Izzy and I talked about the smell along with the colors and shapes we saw. As Izzy felt the inside we discussed how that felt and looked. I introduced new adjectives to her vocabulary as we described the pumpkin together. Language: Gaining new positional word vocabulary such as, in/out, before/after & first/next/last. Gaining these vocabulary words and understanding their definition: pumpkin, round, gooey, slimy, orange, seeds, squishy, hard, stringy, smooth. Depending on the child’s age they may also be learning new colors, adjectives, and how to ask questions or explain what they see. Cognitive: Gaining counting and one to one correspondence math skills when counting as they scoop. Physical: Refining fine motor skills while choosing pieces for the Jack O’ Lantern’s face and while pushing them onto the face. Sensory Development: Exploring and tolerating touching pumpkin juices, guts, seeds and the pumpkin smell. Once the pumpkin has been gutted. Work with the child to sort the seeds and pumpkin guts. After you have finished sorting these two things you are ready to weigh them. Izzy and I found that a 1/4 measuring cup of pumpkin guts weighs twice as much as the seeds. Even then we saw they still weren’t even. So the 1/4 cup of guts weighed more than two 1/4 cups of seeds. After we saw this I took out the 1/2 cup and we poured 1/4 cup of seeds, 2 times into the 1/2 cup to fill it out. This allowed Izzy to see that 1/4 plus 1/4 equals 1/2. This exposes her to the math concept… fractions. Exposing children to these things early is important. It’s okay if they don’t fully understand after 1 activity, but the more exposure we give them, the more prior knowledge they have to build on when they are in school working on larger concepts. After all these are the building blocks of their math comprehension. I linked measuring cups and Izzy’s weighing scale below for you. Language: Gaining new positional word vocabulary such as, in/out, before/after & first/next/last. Gaining new vocabulary words and understanding their definition: pumpkin, seeds, pumpkin guts, gooey, squishy, wet, slimy, mushy & hard. Depending on the child’s age they may also be learning new colors, adjectives, and how to ask questions or explain what they see. 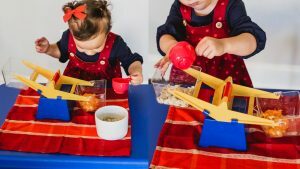 Cognitive: Gaining counting and one to one correspondence math skills when counting some seeds or counting how many scoops are being put in the buckets on the weighing scale. Physical: Refining fine motor skills while scooping and dumping. Sensory Development: Exploring and tolerating touching pumpkin guts and seeds. For younger children carving can be difficult. Not only for the child, but for the parent. You may not want them using sharp tools and then you end up doing 90% of the work. Izzy enjoyed recreating faces on her pumpkin, making it a Jack O’ Lantern using stick in pumpkin face pieces. Discuss with the child that the pumpkin becomes a Jack O’ Lantern when it is given a face. Explain how a Jack O’ Lantern typically is given a carved face (as soon in boots you have read together). A Light goes inside the pumpkin making it glow and become a lantern. Discuss what a lantern is and share images of different lanterns with your child. Engage with your child while they create their Jack O’ Lantern. Ask they to count how many pieces they used for the face or count with them. Point as you count to build on one to one correspondence understanding. I linked a few options for creating pumpkin faces after the developmental outcomes. Language: Gaining new positional word vocabulary such as, in/out, before/after & first/next/last. Gaining these vocabulary words and understanding their definition: lantern, pumpkin, Jack O’ Lantern, face, eyes, nose, eyebrows & mouth. Depending on the child’s age they may also be learning new colors, adjectives, and how to ask questions or explain what they see. Cognitive: Gaining counting and one to one correspondence math skills when counting out how many pieces where used to create their Jack O’ Lantern. Sensory Development: Exploring and tolerating touching pumpkin juices. 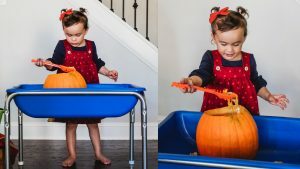 Girl, I amazed at how you turn pumpkins and playing into LEARNING! You. are. AMAZING! Awe thank you! You are so sweet! Looks like she had fun! Jacob hates pumpkin guts!!! We don’t have our pumpkins yet but I look forward to trying these ideas out when we do!! 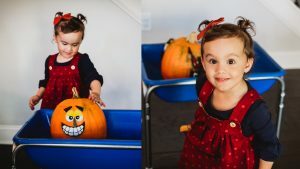 We haven’t carved pumpkins yet, but I love these ideas! I love sensory games and tools for young kids! Looks like she is loving this activity!